Segmented linear dsRNA genome: 2 segments (A,B) encode for 5 proteins. 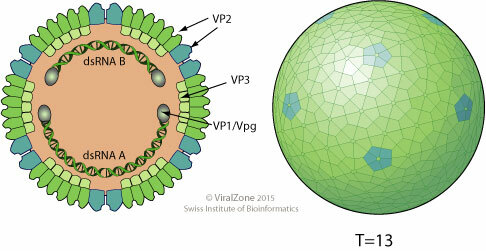 VP1 is found in a free form and covalently attached at the 5' genomic RNA end (VPg). Segments size is about 2.9-3 kb. Genome total size is about 6 kb. Genomic segment A encodes for a structural polyprotein which is matured in cis by VP4. It also encodes an alternative ORF (VP5) translated possibly by leaky scanning Genomic segment B encodes for VP1. NATURAL HOSTS Young chickens (3-6 weeks) and other fowl. TROPISM IBDV infects the precursors of antibody-producing B cells in the bursa of Fabricius. ASSOCIATED DISEASES IBDV causes severe inflammation of the bursa of Fabricius. The disease causes considerable morbidity and mortality in an acute form or as a consequence of severe immunosupression provoked by the destruction of immature B-lymphocytes within the bursa of Fabricius. TRANSMISSION Transmission is thought to be through contaminated feed or water. VACCINE Infectious bursal disease virus: IBD-VAC and CEVAC-IBVK. Infectious bursal disease virus (IBDV) destroys its target cells, the B-lymphocytes precursors, by inducing caspases activation and apoptosis. VP5 seems to be the major apoptosis inducer through its interaction with the voltage-dependent anion channel 2 (VDAC2) .